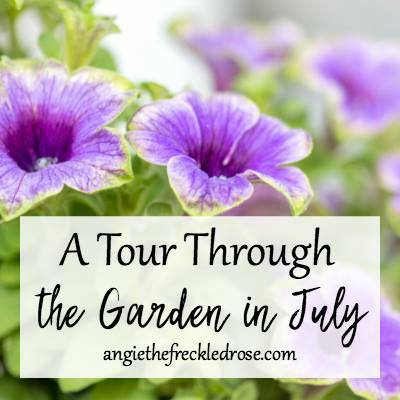 This summer garden tour post is part of the Tuesdays In The Garden session where we are sharing garden harvests. 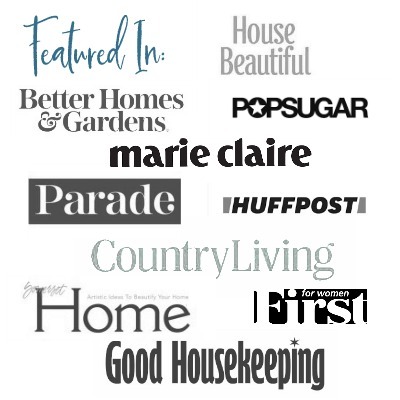 When you are mainly an ornamental gardener your harvests include more flowers than veggies, and today the theme for Tuesdays In The Garden is garden harvest, so I thought I’d showcase some of my pretty blooms with a summer garden tour. Don’t forget to scroll to the end to see what they other gardeners are harvesting this time of year. By this time many of the pretty peonies and other spring blooms perennials and shrubs are done flowering. Still, there are plenty of flowers to admire. I also like the look of different textures and shades of foliage. The garden above has a couple of huge blue hostas that work well with the variegated Solomon seal and chartreuse mini hosta leaves. The pretty heart-shaped leaf in the front is a perennial begonia. Soon it and the hosta will have pretty flowers that will last through the end of summer. Here’s a shot, also of the back of our house, with more hosta and hardy begonia. There is also a Japanese painted fern, hellebore, goat’s beard and heuchera. All of these perennials grow well in this shady side north facing side of the house. And now for some color. Our back hillside receives plenty of sun and the coneflower and black-eyed susan plants are putting on a great show. Mixed in with a few volunteer rose campion for more bright pink color. A nice combination of betony with Johnson’s Blue geranium. Pretty purple blooms on this hosta. I like the way it spills onto the sidewalk. Many of my lavender and geraniums do that to. My husband’s not so much of a fan. Fragrant and bright, this is an Easter lily that I picked up a year ago and planted it after the holiday. Summer is the normal bloom time for this lily, so if you purchase on in March or April, keep it around and plant it in the garden. It should come back year after year. Summer is also the best bloom time for hydrangea in my garden. Here’s a pretty lace cap called Blue Billows. It’s getting over run by anemone but I’m trying to decide it I want to put out the anemone or leave it. Now H. arborescens comes in a pink variety called ‘Invinibelle Spirit.’ Also very hardy though the blooms are a bit smaller. And, as you can see the deer love it. I was lucky enough to capture this photo before all the tops were eaten. One of the most vigorous hydrangea, H. paniculata ‘Limelight’ hasn’t even begun to bloom yet. You can almost make out the start of a bloom here and in a few weeks this shrub will full of blooms. And now for a couple of interesting garden finds. I really like this picture showing how a hardy geranium which is usually only a foot or two tall, made its way up through this lace cap hydrangea. The Meyer lemon tree must be enjoying the light, humidity and/or the temperature outside. Just look at all the new leaf growth. My final picture for you today is the beautiful sepals on this clematis. I think I might love this dappled mix of green and purple more than the flowers. Now let’s see what my fellow Tuesdays in the Garden friends are sharing this week. YOU’RE GARDEN IS AWESOME ,LOVE THE VARIETY OF HYDRANGEAS AND HOSTAS. THEY BOTH ARE MY FAVORITE ,THEY GROW WITH LOVE AND CARE!!! AND ENJOY SPENDING THE DAY IN YOUR BEAUTIFUL GARDEN IT IS INSPIRING AND THANKS FOR THE TOUR …. So glad you enjoyed the tour. I used to go on a lot of garden tours and now with the blog I don’t get a chance to do as much. Isn’t great that you can tour gardens and homes from home on the internet now. Thanks for stopping by and come back again soon! I’m so glad you enjoyed the tour. Your garden pics are always so beautiful. I especially coveted your drumstick allium and need to order some for next year. I love the ones I have, but they only bloom in the spring. As you can see my summer garden is very green, and there is no such thing as too much color. I need you to come to Iowa and help me landscape! 🙂 Love your shade gardens and cone flowers are some of my favorite sun flowers. I started 3 little citrus plants this year and Meyer’s Lemon is one of them. I hope I get some lemons some day too. Thanks for the garden tour, Patti! I enjoyed it a lot. Thank you. My Meyer Lemon has had it’s ups and downs but does produce a handful of lemons for me each year. It seems to be loving the weather outside this summer. Full of new growth and now a bunch of new flowers have sprouted. They are awesome little trees to grow. I’m sure you will love growing them too. How beautiful! And that you can grow any of it with deer – wow! Here at my mom’s garden, anything that isn’t protected by the motion sprinklers are usually eaten even before they can bloom (unless they’re roses – then they wait for the yummy blooms, ha!). So many great flowers in your garden. We used to have coneflowers are our old how and I miss them. They are so simple and pretty too. Our hostas spill out onto the sidewalk and people stop to take photos of them. My hubby would like to contain them more but they get so huge. I really need to divide them by next year. I love hydrangeas, not too much work and so many beautiful blooms. We have three total in our flower garden and they are all from the same original plant but different shade from their different locations. I would enjoy spending the day in your garden it looks just lovely. Thank you for your kind comment. I know I would love to visit your garden too. Perhaps one of these days! Everything at your place is so pretty and I love all those shades of green. I have a dream to grow hydrangeas but I’m just not so sure how they’ll do down here. I see others try but I think honestly it’s just to hot. Your garden reminds me of my grandmas yard. Everything is thriving and maintained by someone who cares. Awesome job!! I’m so touched that you think my garden is like your grandmother’s.